Southeast Asia. Known for its hot, humid climate. The land of flip-flops and hippie pants. Sounds like a pretty easy part of the world to pack for, right? Well, yes and no. It's true that packing for my 7-week trip was not as difficult as the dual-climate trip I had to pack for around the same time last year, but it also wasn't as easy a throwing some tank tops and flip flops in a bag, either. I was going to London and Hong Kong (and northern Vietnam) before heading to the hot, steamy part of Asia — meaning I still needed things like pants, a heavier jacket, and shoes other than flip-flops. Southeast Asia, hot as it is, is home to more conservative cultures — meaning short shorts and tank tops are actually inappropriate in many cases. I therefore had to make sure I had longer, knee-length pieces in my bag, as well as t-shirts I could layer for visiting temples and other religious sites (because many times throwing a scarf around your shoulders won't cut it). I was spending a week volunteering at an elephant park in Thailand — meaning I needed clothes that could get ruined, as well as sturdy, closed-toed shoes. I knew that once I got to the hotter destinations, I would be sweating A LOT — meaning I needed to bring a few extra things so I didn't have to worry about doing laundry every 2 or 3 days. I found some soft, thin pants that would work in all sorts of weather conditions, and packed a pair of for the plane and London. I purchased a down jacket at home for London and Hong Kong, which compressed into a small pouch for the rest of the trip. I bought a pair of , which have a closed-toe, but also work as walking sandals. This way I didn't have to bring a pair of sneakers just for the elephant park. I also bought 2 extra pairs of shorts and 2 tank tops at a market right before going to the elephant park, which I wore for the dirtier tasks throughout the week, and then donated to the park afterwards. This may seem like a lot to fit into a 44L bag, but I assure you that my Kelty is quite spacious and has lots of useful pockets! 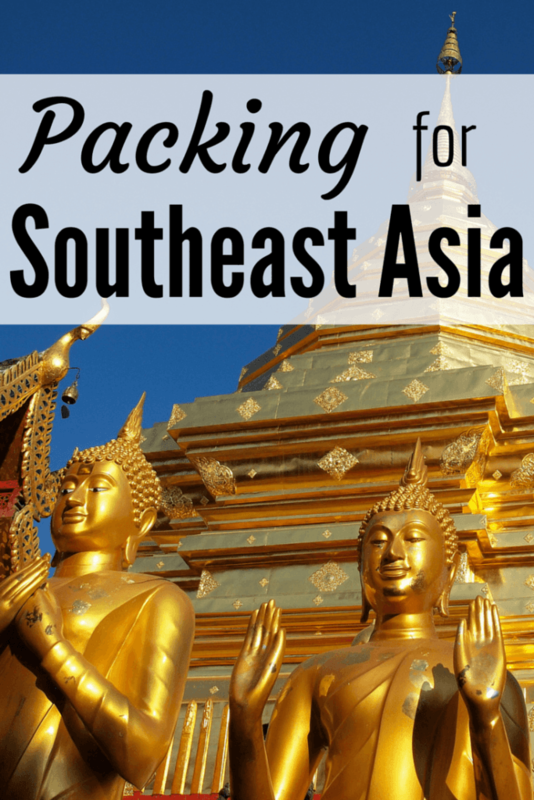 () A backpack is ideal for Southeast Asia since it's much easier to carry around than rolling luggage in this part of the world. I took my trusty for this trip, since it's already quite dirty and couldn't get any worse on buses or tuk-tuks in Asia. It's also slash-proof and can be locked around bike baskets and chairs, making me feel safer traveling with it. This bag, along with my purse, is with me at all times on travel days. As a blogger, there's some stuff that I just can't leave at home — like my computer, camera gear, etc. On this trip, however, I will admit that I could have survived with less clothing than I took. I could have left a skirt and a pair of pants at home. I could have just brought 1 swim suit, as I only ended up spending a week at the beach. And I could have cut the number of shirts I took in half. If not for the time in London and Hong Kong, I wouldn't have needed the down jacket, the TOMs, an umbrella, or my hair dryer, either. I could have brought the bare minimum and just gone shopping at markets along the way. In this part of the world, it's incredibly easy to accumulate things. Clothing is cheap at every market, and since it's cheap you can get rid of it along the way when you get tired of it. And speaking of cheap clothing at markets… I added multiple tank tops and t-shirts to my bag in Cambodia, along with a pair of “hippie” pants and 2 tailored dresses in Vietnam… not to mention other gifts/souvenirs I bought! I ended up buying a larger secondary backpack in Bangkok, as my main bag was mostly full when I left home, and my Pacsafe isn't very roomy, either. Next time: less shopping! In the end, I'm REALLY glad I brought those thin pants, zip-up hoodie, and socks. It got quite chilly in northern Vietnam and downright cold in northern Thailand at night. I was also really happy that I brought a . I only used it once — on an overnight train in Vietnam — but it was an instance where everyone else in my train car was jealous of me. If I had stayed in more hostels, I'm sure I would have gotten even more use out of it. It also takes up virtually no room, so it's a no brainer to leave on my packing list. I also really loved my – this was the first time I used this smaller backpack, and it honestly was perfect for traveling in this part of the world. In Southeast Asia, you're often lugging your bag in and out of all sorts of vehicles, from buses to vans to songthaews to tuk-tuks. Having something small and compact is ideal, and this is one part of the world I would almost always recommend taking a backpack as opposed to rolling luggage. 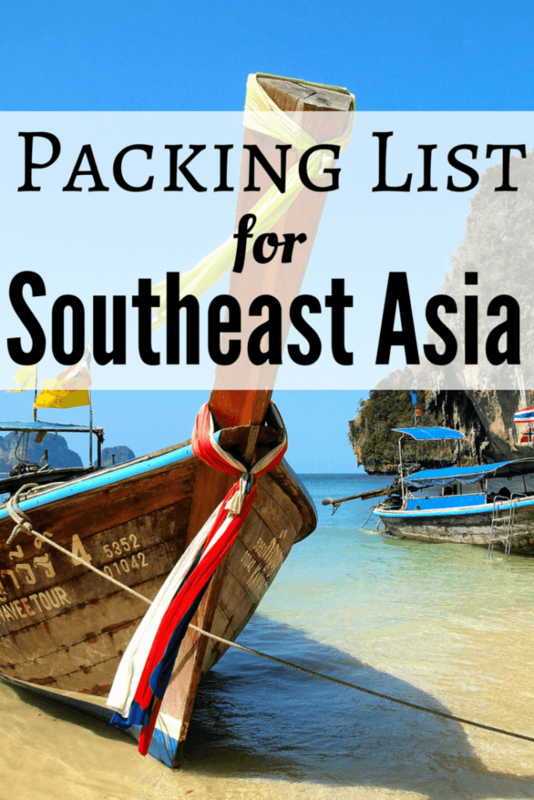 What would your must-packs for Southeast Asia include (or not include)? *Note: There are affiliate links in this post, meaning that if you click on an Amazon link and buy anything, I get a small percentage. It doesn't cost you any more, but contributes a little bit to my travel fund! Excellent Post, Akatuki!! I hope to become like you as my travels progress. I went to Peru for 8 DAYS and had two checked bags and my PacSafe (Which I bought Last year thanks to another post of yours)!! I just always seem to overpack and always at the last minute. It sees as if I just panic!! Hahaha, overpacking is very easy to do! But I’ll bet you didn’t need everything you took with you to Peru! The more you travel, the easier it will be to edit your packing list, I promise. OK THIS is exactly what I needed. I’m only traveling through SE Asia and Japan for 3 months and I know between the regions my clothing options will differ. I figured I could get things like t-shirts and skirts while I’m in the region, so you confirmed my thoughts! Yes, you definitely will have no trouble buying things along the way (especially in SE Asia). Though, I would suggest bringing shorts/pants that you like – clothing other than dresses is sometimes only made in very tiny Asian sizes over there! Yeah, I definitely should have taken less to begin with, since I DID end up buying stuff over there. Oh well. Live and learn! Oh wow…that’s quite a backpack! Amazing stuff you carried.I like your clothes – so comfy yet stylish. I’m all about comfy and colorful! I noticed you use packing cubes. What’s your take on them? I’ve never used them but am considering getting some for my next trip. Is there a brand you would recommend? I LOVE my packing cubes! I never travel anywhere without them anymore. They make it so easy to organize your bag, and then you don’t have to go digging through everything to find a shirt. I use Eagle Creek ones (I think there’s an affiliate link for them on my main “Packing” page), but the brand doesn’t really matter, I don’t think. In this backpack, I used 2 large ones and one medium one. Excellent, I will check out the link. Thanks! Ah yes, the amazing silk sleep sheet! I love that mine is so tiny, too – it’s so easy to pack that I think it will come everywhere with me from now on! Love how you posted this AFTER your trip! It is so great to be able to see what you brought, but also a reflection on what worked and what you would have changed. Thanks, Jessica! I didn’t have time to write the post before my trip, and then decided that an “after” post would make the most sense anyway! Hi Akatuki, first time commentator but been reading your blog for awhile now, love it! I’m currently shopping for my first backpack and I was wondering if you are able to take your Kelty Redwing 44-Liter Backpack as a carry on? Or do you have to check it when flying? Hey Heather! My Kelty is slightly too big to be used as a carry-on, especially when it’s packed full. I usually check it when traveling and just take my smaller backpack (usually with my laptop in it) as my carry-on. I’ll definitely have to get one of these silk sleep sheets – seems like an affordable alternative to renting sheets everywhere or having to bring your own as they take up sooo much space! YES! It’s such a great item to have in your bag, and takes up hardly any room! Having never been on a trip this long, I’m always curious how you figure out how much you need of things like shampoo and other toiletries. Do you usually buy those things along the way? It depends, really. Some people will suggest buying along the way, but for a trip more than, say, 3 weeks, I tend to just bring a larger bottle of shampoo since I know I’ll be checking a bag anyway. 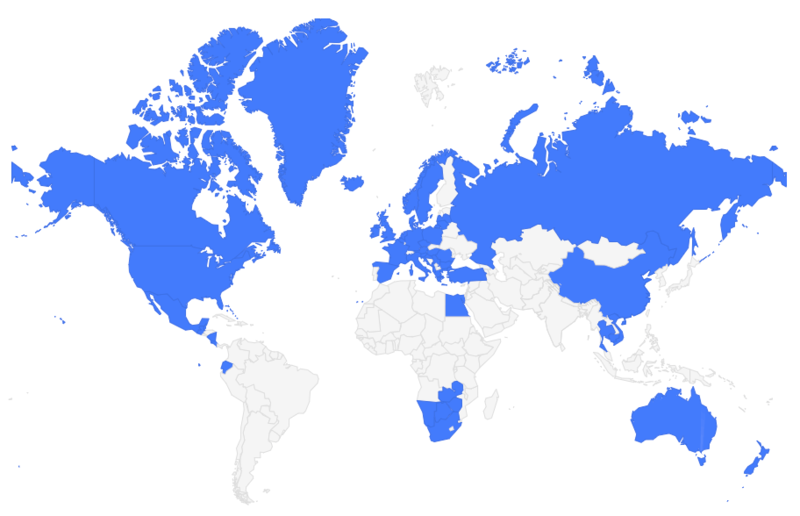 Also, in some parts of the world (Asia included), it’s tricky to find certain things. For example, skin whitening is a big thing in Asia, so buying normal deodorant or any kind of skin cream can be tough if you don’t want to bleach yourself! I brought everything with me to Asia, just to be safe. Some people swear by solid shampoo and soap, which are easier to pack. 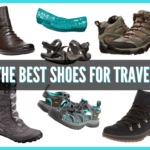 I am keen to get some Keen sandals, how did you go with them? Also, I am totally looking at getting a Kelty backpack but was torn between 44l and 50l (my current backpack is 33l & I managed for a couple of weeks last summer but could use a bit more space), any recommendations? I am super tiny (147cms short), so don’t want to end up like a tortoise stuck on it’s back. I really like my Keens! I have a pair of Tevas (the Tirra sandals), too, and probably prefer those for everyday wear, but the Keen Whispers have a closed-toe, which make them much better for hiking. And as for the Kelty pack, you would probably be fine with the smaller 44L, to be honest. I don’t think it would look too huge on you, and it has so many pockets that you should be able to fit everything in it that you would need (I’ve used it for a 3-month trip before). I think Kelty also makes a women’s version of the Redwing (I think it’s slightly smaller, though) that might be a better fit if you have a smaller torso. I’m a big fan of food posts and packing posts! I just can’t get enough. Thanks for sharing. Packing posts are always popular! Still have no clue why, but I’ll keep writing them since you guys like reading them so much! a silk sheet is something I defintely need to buy… there is nothing nice about fall asleep wondering about what germs you might be gathering. Not fun. No, not fun at all! Mine was great to use on a questionable train – I was actually able to sleep! I’ve never been on a trip for such a long time, but packing is a problem for me even for a 5-7 days trip and yes, it is because of clothes and shoes… I wish my luggage would look as organized as yours! I see that you packed simple and easy-to-combine pieces, is that for the reason that you are trying to make choosing easier, or simply because this is your dressing style? Simple, easy-to-mix-and-match pieces definitely give you more outfit options without having to pack a ton of stuff. My closet at home actually has a lot of funky-patterned clothing, but I find myself drawn to the simpler, colorful stuff most of the time anyway. Nice. Will stay tune and look forward to your Southeast Asian backpacking trail! Hi I am heading to South East Asia in June. Love your packing ideas and you went a lot longer than what I am planning (2 weeks) Just wondering what your bags weighed? We have an in country limit of 33 pounds. What was your carry on The Backpack & Purse? Did you feel safe with holding your purse and Donner bag? As for carry-on bags, it depended on the airline. On some, you can only have one carry-on, so I would have to stuff my purse into my smaller backpack. But yes, my purse and small backpack were usually my carry-ons. And yes, I always felt safe with all my stuff on. When it comes to purses especially, I always suggest something made of study material with a cross-body strap. I’ve never had any issues traveling with a bag like this! Hey, I’m loving your packing ideas! Everything looks so organised. I’ve seen a lot of posts about backpacks… Most say the smaller the better. Yours was 44litre. Twice I’ve been advised on a 60litre pack, but it seems way too big. In your opinion, for a trips for a few weeks, would 35litre be sufficient? It all depends on your and your personal preferences, Carina! I have a 60L backpack, too, and that was just fine for trips of a couple month. But I like my smaller one, too, since it’s usually much lighter. You could probably get away with taking a 35L pack on a plane as a carry-on, which would be handy. Hi! Great post. I’m just wondering how you managed having the two packs on a daily basis (one large and one small)? How did you carry both at once/did the large one usually stay at the hostels during the day? You do what’s called a “double turtle” – wear the big pack on your back, and the smaller daypack on your front (basically wearing it backwards). But yes, my larger pack always stays at my hostel/hotel when I’m in one place. I only have to carry everything on travel days! Hi there, I am travelling Southeast Asia next year for 3 months and was just wondering what you think for bedding for the whole trip? I see you took a silk liner, would that be enough if you wore staying in dorms and hostels? Would you need a sleeping bag? I am also wanting to take a GoPro and the fact it could either get lost or stolen how do you recommended saving your photos along the way? Hey Becky! You probably won’t need a sleeping bag. Most hostels are fine and will provide you with bedding. But the silk liner might come in handy a few times! I wouldn’t suggest taking any more than that, though. As for backing up your photos, that’s a tough one! As a blogger, I always travel with a computer. Meaning I take an external hard drive with me and back up my photos onto it periodically. If you won’t have a computer… maybe take multiple memory cards? Swap them out every couple of weeks, and keep the used ones separate from your GoPro, just in case? Do you have any special advice for packing electronics (tablet, camera, etc)? Would you recommend anythi more than a standard case or perhaps does the humidity prompt extra protection ? No extra protection necessary – just be very aware of cameras, especially if you’re going from the outdoors into air-conditioned buildings frequently. Keeping them in a case or bag should be fine – I didn’t have any trouble with my electronics in Asia! Were you able to use your 44 liter backpack as a carry-on onto the plane or did you have to check it? Thanks! It was quite full, and so I’m pretty sure it was too big to be a carry-on. Plus, I usually have a smaller backpack with my laptop and camera and such, too, so I always check my main backpack. Hi! Great post. I am travelling to southeast asia, Bali to be specific in July and was wondering, did you check your larger backpack, and then take a smaller one and a purse as carry on? I am wondering which is the best to do for my own trip! Yup, I checked my larger backpack and then had a very small backpack and purse as carry-ons. It’s the easiest option, unless you can pack in a small enough bag to carry everything on. Hi Akatuki, I found your post useful and just wanted to let you know that. Thanks very much! So glad you found it helpful, Kelsey! This was a great post to compare my own packing list to! I was wondering where you spent your week volunteering with elephants? I’ve been thinking about doing the same when I go to Thailand in a few weeks and would love to hear some suggestions from others! Wow thank you! I am going through a dilemma at the moment trying to buy a bag for my next trip. I once backpacked for just 40 days with a 75lt bag practically bringing a change of clothes for each day (just in case) worst idea of my life! It was huge, bulky and so heavy since I over packed…don’t get me wrong its an amazing bag it has now been to 7 festivals with me carrying all the camping gear..just way to big for a person wanting to traveling in comfort. Now I will be traveling Asia for 6 months I want to have the exact right amount of things, the only issue being how big does my bag need to be to fit the bare essentials into. If its too small I will have nothing..but I don’t want one too big either. Its so much easier seeing just how much you fit into you bag – LOADS so it makes me really confident going out and purchasing a 40lt bag now. Glad that I could help! The good thing about traveling in Asia is that it’s usually pretty warm – and summer clothes take up way less room in a bag than winter clothes do!